Wow. As much as I love the holidays, the period between Thanksgiving and Christmas always seems to get shorter and shorter every year. And because yours truly was tragically behind on planning, as usual, most of last week was spent scrambling, and not blogging. So, without further ado, I present - perhaps a little out of order - The Week (and a bit) in Numbers. I have a wonderful crew of colleagues. We have this cute game where we "try" to surprise each other with a card and cake every year, although we've all gotten wise to the idea, so we pretty much know when it's coming from a mile away, especially if a birthday is on a workday. (The only time it's iffy is when the birthday is on a weekend or holiday, then it's anyone's guess if the ambush comes on Friday or Monday - ha!) 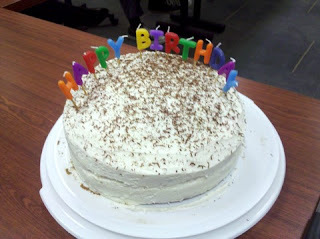 So under the guise of a meeting (which was actually canceled, unbeknownst to me), my colleagues "surprised" me, with a most excellent midnight-chocolate-with-buttercream-frosting cake (made by my boss), and adorned by our division's Happy Birthday candles that we've used and re-used for at least the past two years. And then on Christmas Eve, Matthew and my in-laws surprised me (they really did!) with another birthday cake. And their rendition of Happy Birthday was sung with so much love and caring that I didn't mind at all that it sounded like three cats on a carburetor, nor that I was blushing six ways to Sunday. It was...perfection. For my birthday, Matthew and I went to dinner at one of our favorite spots: the Atwood Cafe, on the main floor of the Hotel Burnham. It's a beautiful place - lots of warm velvety colors and dark wood, amid wrought iron work from the 1900s and mosaic tiles that had once been covered by concrete and "rediscovered" in the late 90s when they redid the whole building. We got a table by the window, and, halfway through our shrimp-chowder-bay-mussels-duck/steak-chocolate-cake dinner, it began to snow those big puffy white flakes that blanket everything and dull every city noise. A magical way to start the week before Christmas. Birthday greetings came from around the world, at all different times, and I'm grateful for each and every one. For the first time in several years, we woke up to a white Christmas, with about 3 inches of snow covering everything. And even though I grew up in a place where Christmas is in summer, I can't imagine it being at any time but winter anymore. At a time when gas prices are going through the roof, we had a Prius for Christmas weekend. 'Nuff said. ....of pure viewing pleasure. Tahmoh Penikett = yum. Jamie Bamber = yummer. Merry Christmas to me. We came back home to a whole lot of snow that had piled up, which necessitated cranking up the snowblower for the first time this season. Don't know what it is, but every time I use it, I feel oh-so-very butch. Vroom vroom. And in non-Christmas or birthday news, 40 minutes is all it took yesterday for a podiatrist to take a cast of my woefully-flat feet to make some orthotics that will hopefully relieve some of my shin splint pain (while also encouraging me to walk less neanderthal-like), as well as recommend physical therapy that I will start in the New Year. Marathon aspirations temporarily iced. Sigh.